perhapablog... and other ramblings: ladies and gentlemen...the fabulous nick cardy! i love comics! i love the art, love the stories, love the characters, and especially, i love those people who have, do, and will entertain me with their talents, their dreams, their visions. and i love nick cardy. 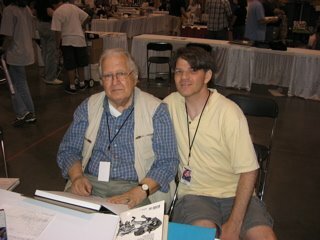 for those not familiar, nick drew teen titans, aquaman, bat lash, and brave and the bold in a series of impressive runs throughout the 60's and 70's. he is a cartoonist, an illustrator, an amazing storyteller (both as an artist and as a conversationalist) and he is now my friend. i've written this before; about how mike and i met nick at heroescon back in '98. how we continued to hover around him and thank him for all the years of enjoyment he gave us with his wonderful, imaginative art. how we became fast friends and make it a point to (try to) take him to dinner whenever we'd see him at a show. we added craig to the mix in, when? 2000? 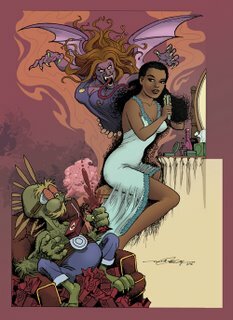 since then, nick and i chat on the phone from time to time and, with the commission of the perhapanauts pin-up you see below, at least three times a week. the conversation does not stay on comics for long. we talk about movies, history, life, relationships, dogs, ghosts, and everything. he has become a mentor to me and he's just a really great guy! if you're smart you'll pick up the teen titans showcase (now on sale!) and see the fun and energy he puts into all his work, then and now! this pin-up was, of course, colored by our incomparable rico renzi. i'll be talking more about him next time! Great to hear that things are moving along with Perhapanauts. Can't wait for the trade, and I love the title of the second arc. Second chances sounds fitting, and we can all use some of those once in awhile! The Nick Cardy art rules, and I'm excited to see what other pin-ups will be included in the trade. Glad to hear you've got more Marvel stuff coming out. I don't read alot of Marvel titles these days, but if it has your name on it, I'm interested.